How much does tinting reduce heat? How Much Does Window Tint Reduce Heat? The short answer? Way more than you think. Read on for the details. A blinding sun can make driving very uncomfortable. During the hot summer months, there seems to be no escape from it, especially in your vehicle. After a while, air conditioning will only offer so much relief, not to mention the blinding glare from direct sunlight can become a dangerous distraction. At Diversity Auto Films we can change all that, putting you back in control for a cooler, more comfortable ride. By blocking more than 99% of harmful ultraviolet (UV) rays, our window tint protects passengers from skin damage and the interior of your vehicle from fading and cracking. And on the road, window tint helps reduce blinding glare and painful eye strain. You can choose from a variety of shades and privacy levels, and can opt for premium ceramic films that have the same heat rejection properties without the deep black shade. Window tint is recommended by The Skin Cancer Foundation as part of a comprehensive skin care program. Basically, window tint is designed to reject the thermal rays that make sunlight increase temperature. Llumar’s window tint is spectrally-selective, meaning that it only lets certain wavelengths of radiation pass through. By blocking the wavelengths that create heat, and passing the ones that create natural light, our window tint acts as a filter that prevents interior heating without blocking the illuminating features of the sun’s rays. How Much Heat Can It Block? 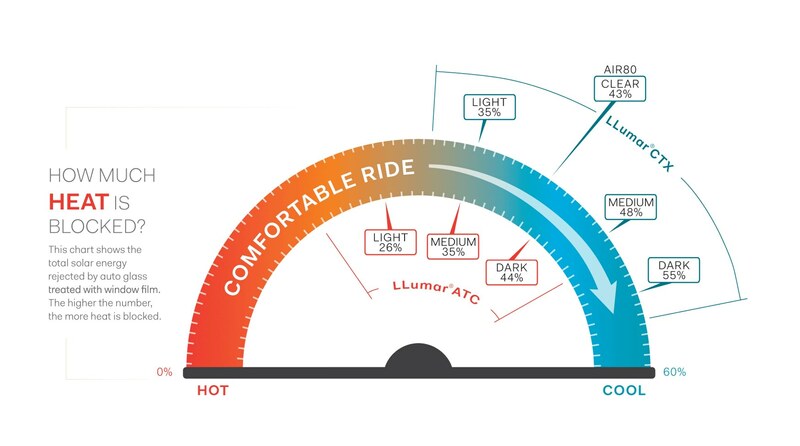 Heat rejection properties vary by tint type, shade, and quality. Both LLumar ATC and LLumar CTX Series films offer more than 99% UV protection as well as heat protection. Choosing the LLumar CTX Series will provide Superior heat rejection. And, if the look of traditional dark window film is not your style, LLumar AIR80 film offers similar levels of UV protection and heat rejection. All the specific percentages are on this infographic, click to see it full size. As always, please be in touch with any questions, we would love to hear from you.